Hi all! If you was on my user page you may see that I am studying now so paused my project my I want to rest a little so I wanted to finish some old one so here it is. I made vector of Gokudera using Corel Painer for outline and Photoshop for coloring. Maybe another wall will be in June.. I don’t really know, if I will have some free minute I will make one! Scan: this + some other with left hand.. I can't find it. Title: Just like from song title – Move! And arrows add this effect of moving. All comments and favorites are appreciated! p.s. sorry for not commenting/faving, I’ll find time to watch all walls that I didn’t see! wow! awesome! 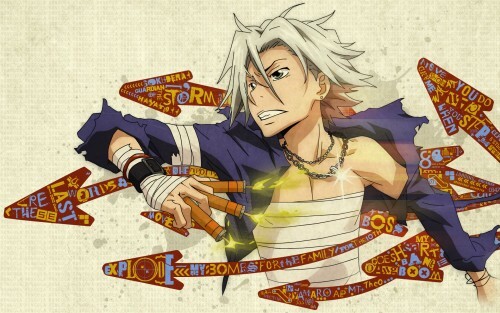 bacjground suits gokudera's hair color! love it! thanks for sharinG! ahhh! i LOVE YOU <333 this goes definitly to deskop! ahh just keep it up! Cause it's goku and it's your amazing skill for this kind of walls again! Ah I always love your wallies, utilizing your awesome skills and you just make it look awesome! Okay that was constructive. <3 fave, hope to see more! OMG! i love it... the arrows, the effects and of course gokudera too. Your works always really awesome and great! Whoah. Nice work. Those arrows must have taken awhile to do o_O Good job. A nice one. I love how the arrows are placed on him. simple and beatiful - great job! I like it... the idea of the arrows is explosive! it will be my best wallpaper, i love it!